Hardin Marine has done it again! Just as they have before, they have revolutionized the marine gauge market with all new gauges. 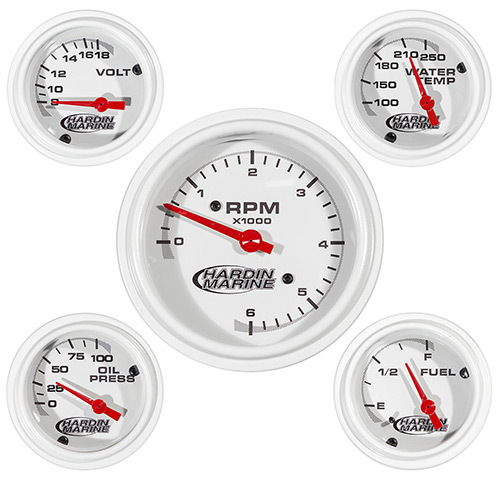 They have taken all the great features that were once only available from the high priced gauge manufacturers and brought them down to an incredibly affordable price. Coupled with flood incandescent lighting, easy gasket sealed bezels and glass lens, couple that to a vibration resistant air core movement and see why this style gauge has become the standard of most boat builders today and the best part of all, it's at a price almost to good to believe. Shop and compare, we're sure your new gauges will be Hardin Marine. Hardin Marine gauges come with white light. Senders sold separately. Not Designed to be used with Diesel Engine. You Save: 21% off MSRP!